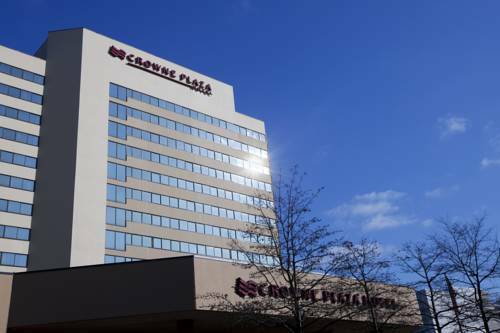 A Standout Among White Plains, NY Hotels for Events Crowne Plaza White Plains-Downtown hotel in Westchester County is perfectly situated for business travelers. Heading to the city? White Plains Metro trains are a mile from the hotel and speed you to Grand Central Terminal in about 30 minutes. Enjoy complimentary shuttle service to Westchester County Airport, eight miles away, or taxi to NYCs LaGuardia or JFK airports within an hour. Corporate offices of IBM Armonk, PepsiCo and MasterCard are a short drive from the hotel. You can work in our on-site, 24-hour Business Center, staffed by a technical concierge. For collaborative functions, we are the premier meeting and event venue in White Plains. We welcome groups of all sizes, with complimentary Wi-Fi and flexible catering options. A Crowne Plaza Meetings Director helps plan and handle every detail. Our hotel in White Plains makes a convenient base for navigating Hudson River Valley attractions. Historic sites and shopping venues are nearby, including The Westchester mall next door and Washington Irving's Sunnyside, a 20-minute drive west. Dining options add convenience to your stay. Eat a healthy breakfast from the buffet at Whisk. Explore small plates, diverse entrees and local craft beers at Mix, our cocktail bar and kitchen. Work it off later at our Fitness Center or swim a few laps in the heated indoor pool. Whisk: Have a classic American dinner in a traditional setting at the Whisk, which is conveniently located on the lobby level. This full service restaurant is certain to satisfy your appetite with breakfast and lunch. Mix Cocktail Bar and Kitchen: Savor a few drinks after a long day of work at Mix Cocktail Bar and Kitchen, located on the lobby level. Pelham: The Pelham room is one of three function rooms with natural light. It is a great option for a break-out meeting or for meal funcitons. It has direct access to the sidewalk patio. Larchmont: The Larchmont room is divisible into two rooms. It is adjacent to the pool patio and works well for meal functions, as well as corporate meetings. It also serves as overflow space for exhibits that are positioned on the pool patio space. Sprainbrook: The Sprainbrook room is ample sized for corporate meetings of all types. It is adjacent to the pool patio area, and is not connected to any other rooms with an airwall. Yorktown: The Yorktown room is ample sized for corporate meetings of all types. It is adjacent to the pool patio area, and is not connected to any other rooms with an airwall. Plaza Ballroom: Plaza Ballroom is the hotel's largest meeting room at 5,940 squaree feet and can accommodate up to 800 guests. The room is divisible into four sections of approximately equal size.